The much extended hit will be moving uptown to Theatre 42, 422 W. 42nd Street, right next to the Theatre Row Diner. The uptown run will begin 2/10/19; opening 2/21/19. Stephen Skybell and Jackie Hoffman are on board again with other cast changes TBA. 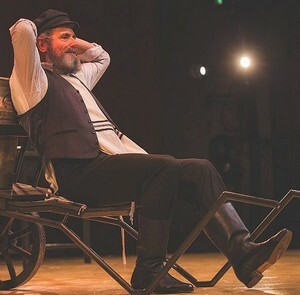 The National Yiddish Theatre Folksbiene's (NYTF) excellent Yiddish production of Fiddler on the Roof as directed by Joel Grey, translated by Shraga Friedman and performed by his fine cast gives us no major revelations about the musical. However, it does make us fall in love with Tevye, his wife, Golde, and his three daughters all over again. That renewed love affair is, of course, a tribute to Joseph Stein's book, based on the stories of Sholem Aleichem, Jerry Bock's music, and Sheldon Harnick's lyrics — all of which so thoroughly captured Yiddishkeit, that we hear Yiddish even when the actors are speaking and singing in English. In fact, about 80 percent of the English translation that is projected overhead (along with Russian) comes from the original musical. This staging brilliantly emphasizes the sorrow that colors the lives of the people who live in Anatevke and the brutality of the tragedy that eventually befalls them. Much of this is realized through Beowulf Boritt's set, dominated by hanging panels of paper. On one of these panels, the word "Torah" is written in Hebrew. Is this Fiddler telling us the Torah is being unravelled along with Tevye's beloved tradition, as one after the other, his daughters choose men without asking his approval? Certainly the marauding Russians at the end of act one make sure to tear one of the the Torah panels in half. But just as certainly the panel is taped together in act two. Costume designer Ann Hould-Ward has dressed the Jewish population mostly in subdued grays and browns. The Russians wear bright red sashes around their waists. Is this symbolic of passion or bloody violence? Naturally, the fate of this musical lies to a great extent, on the shoulders of the actor who plays Tevye. The good news is that Steven Skybell is warm and funny and philosophical and ... well ... everything we want this long-suffering milkman to be. What's more, Jackie Hoffman is priceless as Yente, the canny and ever-complaining matchmaker. And Rachel Zatcoff (Tsaytl), Stephanie Lynne Mason (Hodl) and Rosie Jo Neddy (Khave) are all appropriately feisty and innocent as Tevye's daughters. When Pertshik, the radical, tells Tevye that his daughter, Hodl "has a quick and witty tongue," Tevye acknowledges that she gets the wit from her father but "The tongue she gets from her mother." Indeed Mary Illes has little of the tenderness one associates with Golde and a bit more of her shrewishness. This, however, may be entirely fitting in a revival that underlines the darker aspects of the musical. When the Russians teach the Jews how to dance in their slavic tradition as they all celebrate Leyzer's betrothal to Tsaytl, one sees a unique opportunity for peaceful, even harmonious, coexistence. This dream is destroyed when the Jews are forced to leave their beloved shtetl. Sholem Aleichem was the pen name of Solomon Naumovich Rabinovich. Surely the writer was telling us something when he chose a name that means "peace be with you." And the musical based on his stories cautions us that we cannot have peace when we are hostile to the foreigners among us. Cast: cast: Steven Skybell (Tevye), Jackie Hoffman (Yente), Jennifer Babiak (Golde), Joanne Borts (Sheyndl), Michael Einav (Ensemble), Lisa Fishman (Bobe Tsatyl), Kirk Geritano (Avrom)Abby Goldfarb (Female Swing), Samantha Hahn (Beylke), Cameron Johnson (Fyedka), John Giesige (Male Swing/Dance Captain), Ben Liebert (Motl Kamzoyl), Moshe Lobel (Understudy), Stephanie Lynne Mason as (Hodl), Evan Mayer (Sasha), Rosie Jo Neddy (Khave), Raquel Nobile (Shprintze), Jonathan Quigley (Ensemble), Nick Raynor (Yosl), Bruce Sabath (Leyzer- Volf), Kayleen Seidl (Ensemble), Drew Seigla (Perchik); Adam B. Shapiro (Der Rov), Jodi Snyder (Frume-Sore), James Monroe Števko (Mendl), Lauren Jeanne Thomas as (Der Fiddler); Bobby Underwood (Der Gradavoy), Mikhl Yashinsky (Nokhum/Mordkhe), Rachel Zatcoff (Tsaytl). Production Consultants: lyricist Sheldon Harnick and iconic producer/director Hal Prince. Reviewed by Paulanne Simmons at July 12th Press preview update: After leaving the downtown venue it will move uptown to Theatre 42, 422 W. 42nd Street, from 2/10/19; opening 2/21/19.